It has been an article of faith a among drivers, passed down from one generation of motorists to another: change your oil every 3,000 miles. But do you really have to? It all depends on the age of the vehicle you're driving, automotive experts say. "There was a time when 3,000 miles was a good guideline," Philip Reed, senior consumer advice editor for the car site Edmunds.com , told The New York Times this week. "But it's no longer true for any car bought in the last seven or eight years." So, if you're driving a 2002 model or older, you should probably stick with a 3,000 mile oil change. But beyond that, the automotive experts at Cars.com say how often you should change your oil is an inexact science. Factors like how you drive, the condition and age of the engine, the external environment you drive in, and stop-and-go versus highway driving, all come into play. Since most owners manuals recommend changing oil between 3,000 and 10,000 miles, the Cars.com experts split the difference. "We recommend that you change your oil and filter every 5,000 miles," the experts say on the website. "That's our best estimate. It may be too soon for many people and too late for a few, but for the vast majority, 5,000-mile oil changes will help your engine last to a ripe, old age." Reed says drivers can probably get 7,500 miles between oil changes, depending on driving conditions. 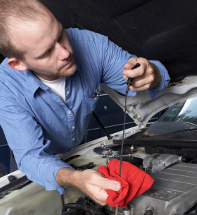 At about $35 per oil change, your automotive shop would like you to stay on the 3,000 mile schedule. But environmentalists take a different view. When newer vehicles entered the market extending the time between needed oil changes, the California Integrated Waste Management Board ran public service announcements about the "3,000 mile myth," urging drivers to get more mileage out of their engine oil. Oil is replaced in engines because, over time, it undergoes thermal breakdown due to high operating temperature. When this happens, the oil becomes less effective as a lubricant. When the oil stops lubricating properly, the engine parts can quickly wear out. Sometimes, regular oil changes might not help. Consumers who drive particular vehicle models have reported problems with "sludge" forming in their engines, even though the oil was not old. Sludge occurs when oxidized oil builds up in an engine. It forms a mucky goo that can cause the engine to seize up. The problem can be caused by failure to change the oil, but also by other factors. And sludge problems seem to occur in some models more than others. "My 2003 Toyota Sienna started smoking," Manny, of Seffer, Fla., told ConsumerAffairs.com. "My mechanic looked at it and said the engine was full of sludge, which is a common problem with Toyotas. He said the repairs would be extensive and to contact Toyota since I had less than 60,000 miles on it and had changed oil on a regular schedule." Toyota owners aren't the only consumers to report the problem. In the mid-2000s, some Volkswagen owners reported similar experiences. "I have a VW Passat with 1.8 Turbo engine," reported Mikhail, of Branson, Mo. "The oil pressure light came on at 60k miles, with the stop engine sign. It was VW's famous engine sludge problem." While changing your oil every 3,000 miles or so is still a good idea if you drive an older model vehicle, check your vehicle's owners manual for advice on changing the oil in newer cars. Increasingly, you'll find they recommend more miles between changes, and at $35 or more per oil change, that can add up over the life of your vehicle. Ask Automan - Flush My Engine?